The Children's Butterfly Bed is a unique product to a collection that is built for kids in mind. The bed frame has a unique and novel printed design to the exterior of the frame that kids will truly love. With excellent sturdy build quality and its low centre of gravity, this bed is strong yet stylish to fit the room around it. Elegant pinks and purple offset on soft white PU leather make this bed a must have. This mattress is especially created for kids keeping their comfort in mind using 5cm layer of high density visco-elastic polymer gel and a total thickness of 15cm. Originally designed for NASA missions, it is soft and pliable following the outline of your body perfectly. The Chand mattress also has a boundary made of reflex foam around the bonnell springs to prevent your children from rolling off the mattress while they sleep. The traditional coil spring system is used to give additional comfort. 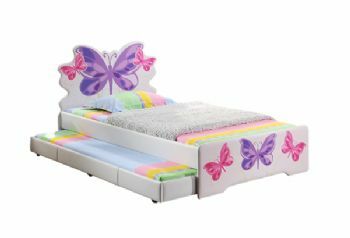 I bought two of these beds for my daughters, they are very very happy, the delivery was super fast and it is excellent quality, value for money.